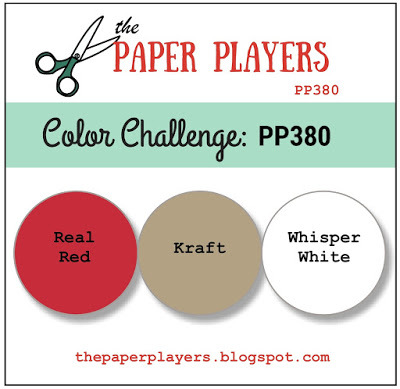 Hello, I spotted this great color combo over at The Paper Players this week and I knew that the colors would work perfectly for the card I had in mind. I am going to try to make a very long story as short as I can. My father fainted at his Bank last Thursday and was rushed to the emergency room. He was later diagnosed with AFIB and admitted for further tests along with stitches on his head. Many hours later, as it’s the peek of tourist season and all the snowbirds are here, we found out he’s a candidate for a Pacemaker. However, Medicare will not pay for it unless his heart stops for intervals longer than three seconds and his only stops for two seconds at at time. Yes, I am serious. Go figure! With that being said, things have been quite stressful for all of us. I could sit here and rattle on and on about his care in the hospital, his unbearable roommate, the fact that he hadn’t slept for 4 days, and that when he was finally able to be discharged (and he called me at the crack of dawn, ready to leave, and was unhooking himself from all his machines), it ended up taking us 8 hours as the paper work was messed up multiple times, including once I reached the pharmacy to finally be on our way. I am not going to bore you with any more of that, instead I am going to focus on the three people that helped me get through this past week. First, it’s the bank teller (Erica) from my father’s bank, that was bound and determined to track me down ( by googling me and finding a newspaper article written about me, and then calling multiple schools till she found the one I was currently working at) to notify me that my father was on route to the hospital. (Later to find out, that when her father was hospitalized for a car crash and died 5 hours later, no-one bothered to try to find her or a family member, so they might have a chance to say their goodbyes. She said she was bound and determined that was not going to happen to anyone else.) Then there are the two Publix pharmacist, one that took so much time with me explaining all the ins and out of my fathers new medications, along with the ones he was currently taking, and fixing the prescriptions that were once again wrong for the third time when I arrived to fill them. Not to mention, the pharmacist from another Publix that saved me $485.00 by making me aware of a coupon I could print out at home for a 30 day free trial. I showed up to the store, with the wrong coupon of course, and after many bumps along the way he somehow managed to get it to me for free anyhow! So, as you can see there are still Good Eggs in this world and these cards are for them (3rd not pictured), with a gift certificate enclosed of course! I am happy to report that my dad ( 87 years young) is doing much better, and at this point we are just taking it day by day till his follow up heart specialist appt. Stamp set is from Stampin Up. Categories: Cards | Tags: Card making, Cards, rubber stamps, Stamping Up, Thank you card | Permalink. Oh Nancy, I am so sorry to hear about your Dad and all that both of you have went through. Thankful that he is home and you got help from the bank teller and the pharmacist. I love your “Good Egg” cads. Take care of yourself and your dad. Much love and prayers. So sorry to hear about your father but I am glad there were people that went the extra mile to assist you. 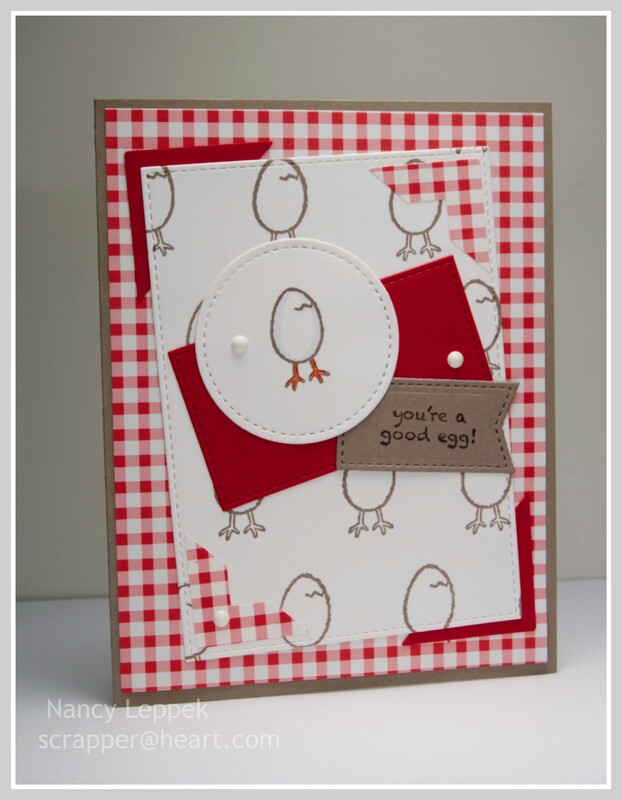 The cards you made are perfect for all those good eggs. I was aware of your Dad’s recent medical condition, but this story is amazing. Leave it to you to find the sunshine in a rainstorm. Love your cards for these caring people and the story behind them made my heart burst. Yes, there certainly are good eggs around, but sometimes they don’t get the credit that they deserve. These cards and gifts will certainly make a statement. Glad that Dad is better and that things will get back to a new normal. And here I heard the hospitals in Florida were top notch. I’m sorry that the week has been tough on you, Nancy, and bless Erica’s heart for seeking you out. No one should have to go to the hospital alone especially an elderly person who may be confused under the circumstances. It is so sweet of you to honor those helpful people with these darling cards. What a story Nancy and so glad it has a Happy Ending. What a blessing Erica and the Pharmacist was for you and so caring. Fabulous fun cards. They will get a real kick out of them and you for being so thoughtful. Hope your Dad is improving by the day. Hugs. Good heavens, what a trial! With today’s medical system, it is so sad to hear your dad’s story. I pray that all works out and those three angels were there to help you and your dad! And what a thoughtful person you are to make them cards, especially ones that are SO CUTE!!! I forgot about this little egg….it works perfectly for the Paper Players colors this week! I might have to CASE one of these myself! Thanks for sharing this with the Players! Thanks LeeAnn for your kindness! My father is doing fairly well considering! CASE away! Hugs! So sorry to hear about your dad. Love your cute card…thanks for joining us at The Paper Players!